We are surfers, day-dreamers, flow-seekers, and awkward dancers. and to teach the importance of sacred play. It’s a great activity that makes lot of fun, keeps you fit, and healthy! We want to share our love for surfing with people who are awesome and keen to learn. We put surf-interested people at the heart of everything we do, informing and inspiring them with trusted content. Did you know there exist way over 300 surf camps worldwide? This pure information overload online made us feel uncomfortable. How do you know which one to chose? Which one will suit your needs best? Don’t worry, we got you covered! Our goal is to create more transparency among surf camps, while saving you money and time in order to find one. and in-depth information on surf regions and surf camps. Good vibes, nice waves and a truly memorable travel experience. The only thing I want to do more than meet amazing people around the world is to protect our nature for future generations. Online marketing enthusiast, with a deep passion for nature and good waves. 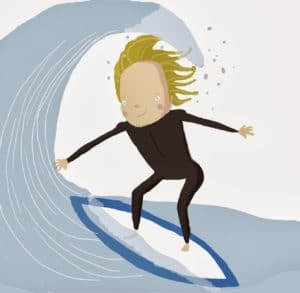 When Chris isn’t busy surfing or helping people achieving their online marketing goals, he can be found eating large amounts of pizza or geeking out about meditation and minimalism. The best part of what we do is getting to connect with people. Maybe you’re more into Pinterest? If you’re more into that business thingy let’s connect on Linkedin. If all else fails, contact us directly! And of course you can always subscribe to our newsletter! We love to connect. Please be one of those people, find us online and say hi! BeyondSurfing verwendet Cookies, um den bestmöglichen Service zu gewährleisten. Wenn Du auf der Webseite weiter surfst, stimmst du der Cookie-Nutzung zu.Ich stimme zu.